This is a master bathroom that I was hired to redesign for some dear friends. Their house was, of course, built during the 1980's in a contemporary style--and while I am sure that all of these design elements had seemed great when they first built their house, my clients called me because they knew that now it was time for a big change. The existing bathroom was long, low-ceilinged, and narrow, with a single tall window at the far end. It is hard to believe that the images below are of the same room...but I know they are. I was there for each step of the transformation. Now with a vaulted ceiling and expanded footprint, the bathroom has a luxurious and relaxing feel, just as my clients had wanted. to the antique botanical print framed especially for the space-- the marriage of traditional and contemporary elements into a funky, eclectic mix, reflects the style of the house and its occupants. 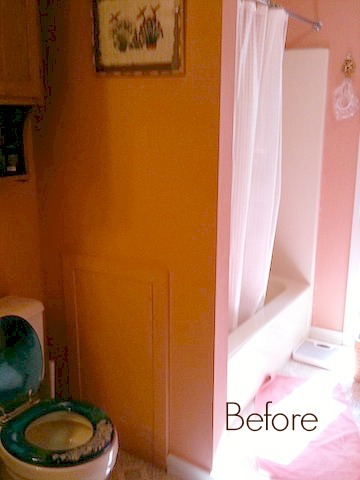 The pinky peach and cramped footprint of this bathroom is now a distant memory, and a lovely, serene space now has taken its place.